Echocardiogram,often referred to as a cardiac echo or simply an echo,is a sonogram of the heart. (It is not abbreviated as ECG,an abbreviation for an electrocardiogram.) Echocardiography uses standard two-dimensional,three-dimensional,and Doppler ultrasound to create images of the heart. Echocardiography has become routinely used in the diagnosis,management,and follow-up of patients with any suspected or known heart diseases.It is one of the most widely used diagnostic tests in cardiology.It can provide a wealth of helpful information,including the size and shape of the heart (internal chamber size quantification),pumping capacity,and the location and extent of any tissue damage.An echocardiogram can also give physicians other estimates of heart function such as a calculation of the cardiac output,ejection fraction,and diastolic function (how well the heart relaxes). A standard echocardiogram is also known as a transthoracic echocardiogram (TTE),or cardiac ultrasound.In this case,the echocardiography transducer (or probe) is placed on the chest wall (or thorax) of the subject,and images are taken through the chest wall.This is a non-invasive,highly accurate and quick assessment of the overall health of the heart. 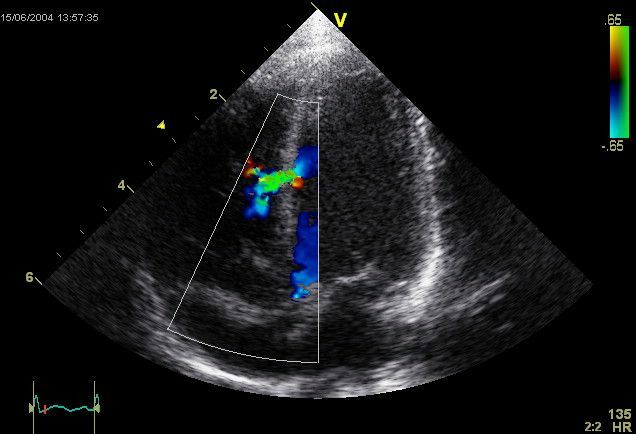 This is an alternative way to perform an echocardiogram.A specialized probe containing an ultrasound transducer at its tip is passed into the patient's esophagus.This allows image and Doppler evaluation from a location directly behind the heart.This is known as a transœsophageal echocardiogram,or TOE (TEE in the United States).Transesophageal echocardiograms are most often utilized when transthoracic images are suboptimal and when a more clear and precise image is needed for assessment.This test is performed in the presence of a cardiologist,registered nurse,and ultrasound technician.Conscious sedation and/or localized numbing medication,may or may not be used in order to make the patient more comfortable during the procedure. A stress echocardiogram,also known as a stress echo or SE,utilizes ultrasound imaging of the heart to assess the wall motion in response to physical stress.First,images of the heart are taken "at rest" to acquire a baseline of the patient's wall motion at a resting heart rate.The patient then walks on a treadmill or utilizes another exercise modality to increase the heart rate to his or her target heart rate,or 85% of the age predicted max heart rate (age predicted max heart rate = 220 − patient's age).Finally,images of the heart are taken "at stress" to assess wall motion at the peak heart rate.A stress echo assesses wall motion of the heart; it does not,however,image the coronary arteries directly.Ischemia of one or more coronary arteries could cause a wall motion abnormality which could indicate coronary artery disease (CAD).The gold standard test to directly image the coronary arteries and directly assess for stenosis or occlusion is a cardiac catheterization.A stress echo is a non-invasive test and is performed in the presence of a licensed medical professional,such as a cardiologist,and a cardiac sonographer. 3D echocardiography (also known as 4D echocardiography when the picture is moving) is now possible,using a matrix array ultrasound probe and an appropriate processing system.This enables detailed anatomical assessment of cardiac pathology,particularly valvular defects,and cardiomyopathies.The ability to slice the virtual heart in infinite planes in an anatomically appropriate manner and to reconstruct three-dimensional images of anatomic structures make 3D echocardiography unique for the understanding of the congenitally malformed heart.Real Time 3-Dimensional echocardiography can be used to guide the location of bioptomes during right ventricular endomyocardial biopsies,placement of catheter delivered valvular devices,and in many other intraoperative assessments.The 3D Echo Box developed by the European Association of Echocardiography offers a complete review of Three Dimensional Echocardiography. Three-dimensional echocardiography technology may feature Anatomical Intelligence,or the use of organ modeling technology to automatically identify anatomy based on generic models.All generic models reference a dataset of anatomical information that uniquely adapts to variability in patient anatomy to perform specific tasks.Built on feature recognition and segmentation algorithms,this technology can provide patient-specific three-dimensional modeling of the heart and other aspects of the anatomy including the brain,lungs,liver,kidney,rib cage and vertebra column. Contrast echocardiography,or Contrast-enhanced ultrasound is the addition of ultrasound contrast medium,or imaging agent,to traditional ultrasonography.The ultrasound contrast is made up of tiny microbubbles filled with a gas core and protein shell.This allows the microbubbles to circulate through the cardiovascular system and return the ultrasound waves creating a highly reflective image.The most commonly used types of ultrasound contrast are known as Definity®(definityimaging.com) and Optison® (optisonimaging.com).Both have been approved by the FDA.There are multiple applications in which contrast-enhanced ultrasound can be useful.The most commonly used application is in the enhancement of LV endocardial borders for assessment of global and regional systolic function.Contrast may also be used to enhance visualization of wall thickening during stress echocardiography,for the assessment of LV thrombus,or for the assessment of other masses in the heart.Contrast echocardiography has also been used to assess blood perfusion throughout myocardium in the case of coronary artery disease.The Contrast Echo Box developed by the European Association of Echocardiography,and the American Society of Echocardiography Contrast Zone both offer a complete review of Contrast Echocardiography.